Why do I need a Pressure Washer? Have you ever thought of how much easier life would be if you had your high-pressure washer at home? It would make washing your car and pushing fallen leaves of your yard less time-consuming. Thankfully, pressure washers have become increasingly more affordable, meaning that you can invest in your high-pressure washing system for outdoor cleaning. You may be wondering to yourself why a pressure washer is a worthy investment. 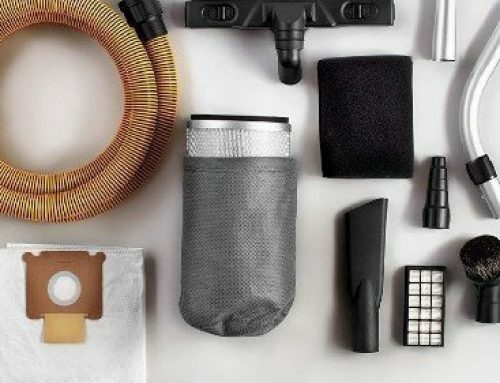 After all, you’re spending money on the tool, lubricants, detergents, and maintenance to keep the tool running, so what can you save? Well, dear reader, you can save quite a bit of money with a pressure washer. Without one of these machines, you’re left at the mercy of traditional garden hoses. In the US, the average amount of water consumed when running a spout for 60 straight seconds is at least 20 GPM (gallons per minute). A pressure washer, depending on the make and model, can use less than 5 GPM. Furthermore, with a pressure washer, apart from using less water, you’ll spend less time cleaning. Pressure washers can deliver upwards of 5,000 PSI (pounds per square inch) of pressure, effectively blasting any caked-on splatters of mud or greasy spills left on your driveway. With a garden hose, you’re only getting about 40 PSI, so you’d be left spraying the spot for several minutes before the mess even thinks about going away. Pressure washers can fall into one of two categories based on their fuel source: gas or electricity. There are two main differences between the two. First of all, gas-powered pressure washers are extremely portable and can be taken anywhere on the face of the Earth. All it needs is a tank full of gas, and it’ll be ready to shoot high-pressure jets of water. Electric pressure washers are tied down by a power cord. You can extend its range of movement by plugging it into an extension cord; just make sure that the extension is rated safe for outdoor use. Secondly, there is a huge difference in power between gas and electric pressure washers. Gas models can deliver more than 10,000 PSI of pressure, whereas electric models are limited to roughly 2,000 PSI max. Deciding whether to get a gas or electric pressure washer depends entirely on what you need the tool to do. 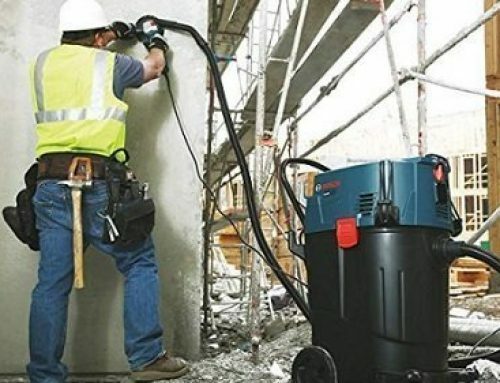 Gas-powered pressure washers with their high-pressure ratings are capable in doing heavy-duty cleaning like spraying graffiti off brick walls. Electric models are designed mainly for common outdoor cleaning jobs. For the remainder of this article, we’ll provide you with our favorite picks of the best pressure washers. However, since no single pressure washer model is a blanket solution for every outdoor cleaning problem, we will split the guide into three substantive sections, mainly the best pressure washers for washing cars, for washing patios, and for washing concrete. If you didn’t already know, the body of a car is quite delicate. Even though it can handle pieces, sand and debris flying towards it while speeding down the freeway, spraying your car with too much pressure could actually end up stripping its paint and leaving dents. In this brief guide, we’ll go over what sort of features and specs a pressure washer should have if you want to use it to spray your car clean. Now, even though you can adjust the pressure on gas-powered pressure cleaners, if you’re looking for a unit specifically to wash your car, a gas-style washer is going to be complete overkill. Electric pressure washers are also more environmentally friendly if you’re into that kind of thing. But the main reason why you should be cautious of gas models is that if one day you forget to reduce the pressure, you could end up shattering the windows of your car. Not a pretty thought at all. In order to effectively clean the surface of your car, the pressure washer needs to deliver at least 1,500 PSI of pressure. Electric models typically have a max pressure rating of around 2,000 PSI so finding an appropriate pressure washer shouldn’t be difficult at all. There are three main ways of adjusting pressure – quick-connect nozzles, twistable spraying wands, and variable pressure dials. All of these systems have their own ups and downs, but they do alter the amount of pressure show out of the wand. This is a matter of personal preference so we can’t decide for you which of the three is objectively more comfortable to work with. Being able to move the pressure washer around, especially since it’s tied down by a power cord, is extremely important in order to clean every crack and crevice in your car’s body. You can effectively extend your range of movement by using an outdoor-safe extension cord, but you should also consider the length of the pressure hose. The appropriate length depends on how far away your car is located from a power outlet, but generally speaking, 35 feet should be more than enough to navigate the spray wand across the entire surface of your vehicle. The only way to give your car that squeaky-clean sheen prior to buffing is by giving it a thorough sudsing after the pre-rinse. Pressure washers draw soap from either an onboard tank or a soap applicator. In our opinion, the more convenient way of spraying soapy bubbles on your car is by using an onboard tank. The spray gun draws detergent from the tank and sprays out a satisfyingly thick layer slippery soap. A soap applicator, on the other hand, is attached to the end of the spray wand and poots out bubbles. However, there are some pretty great soap applicators out there, but they’re quite rare. Another great thing about pressure washers is that they produce enough cleaning power to spray-clean even the toughest, most caked-on pieces of dirt from patios and driveways. The pressure washer doesn’t need to be as delicate when spraying patios and patio furniture, so it’s okay to find a powerful unit. 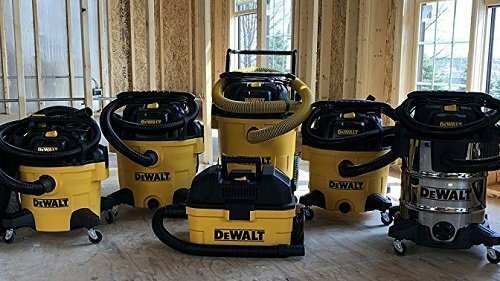 This guide will explain what sort of features and specs will make a pressure washer adept at cleaning decks and outdoor furniture. Cleaning your patio can mean one of two things. Either you want to get rid of mud, dirt, and oil from your patio and rails, or you want to strip it of its paint before applying a fresh coat. If you’re planning on just giving the wood a thorough cleaning, an electric pressure washer will suffice. It only requires about 2,000 PSI to clean wood without stripping paint. However, if you want to strip it of its peeling or cracking paint, then your best bet would be to use a gas-powered pressure washer. To get rid of old paint, the pressure washer needs to produce a minimum of 2,500 PSI which is not available in electric models. Be careful not to go overboard since more than 4,000 PSI can actually cause old wood to become warped permanently. Perhaps you’d like to use your pressure washer for more than just cleaning patios and outdoor furniture. In this case, consider getting a unit that comes with multiple soap tanks or invest in multiple soap applicators. Having more than one tank makes switching detergents much easier than emptying and rinsing out a single tank before dumping in another type of soap. To really get rid of all the dirt trapped in between wood boards and minute cracks, you may want to consider investing in a surface cleaner. A surface cleaner is an attachment for the pressure washer which washes patios, driveways, and any horizontal or vertical surface without wasting time. 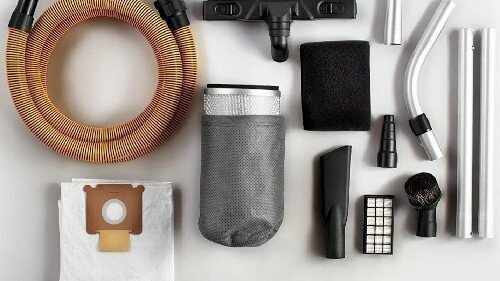 They come with several jets and brushes that not only shoot water at the surface but also brush it to lift and eliminate stains. Surface cleaners are sold separately. Orbital action spraying is available only in pressure washer models that come with the attachment. The orbital action really helps move crusty dirt from crevices found in patios and paved walkways. It’s not something that you want to use on windows or cars since the pressure cannot be adjusted. Instead, it delivers jets of water at the highest PSI rating. 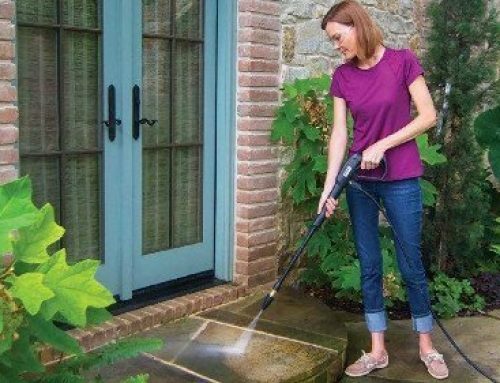 In order to restore concrete, paved walkways, and brick walls back to their former, spotless glory, you’re going to need the heaviest-duty type of pressure washer available. We’re speaking, of course, of gas-powered pressure washers. Let’s see what sort of things a tank of a pressure washer needs to clean concrete surfaces. Spray-cleaning concrete, brick, and stone surfaces cannot be done with finesse. Electric pressure washers can help lift dirt, but if really want to restore concrete, then only a gas-style pressure washer will work. 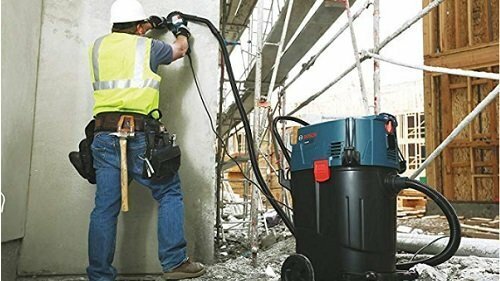 Cleaning concrete can be done with something as little as 2,000 PSI of power, but to erase graffiti, a heavy-duty gas model that generates 4,000 PSI would work most effectively. However – we cannot stress this enough – you need to be absolutely sure that the pressure washer is NOT set to its highest pressure setting when washing more delicate surfaces like cars, windows, and patios. You could end up destroying them and pushing little fragments of the material down the gutter. Even though there aren’t any power cords tying down gas pressure washers, you still need to be mindful about how maneuverable the machine is. Take a look at the unit’s weight, wheels, and length of pressure hose. Gas-style pressure washers can weigh upwards of 100 pounds, so they need durable tires to take them across long yards or walkways. Orbital action spray wands are a great way to get rid of paint and restore concrete and bricks. They spray water at the machine’s highest PSI setting, so stand back and hold on tight if you get a 3,000-plus-PSI model. The swirling jet of water can cause the wand to turn on its own accord. If you’re cleaning concrete floors, a surface cleaner will help you get rid of any stains much quicker than a 0° spray. It divides the PSI between its multiple jets, but it also keeps the spray closer to the surface, delivering the most pressure possible. If you’re cleaning wide concrete driveways, try and find a wide surface cleaner; this will help you finish your cleaning task much quicker so you won’t get sunburned. Gas-powered pressure washers run on gas (duh). Since it uses gasoline, you’ll want to top it off as often as possible to prevent a premature death. Also, notice how large the tank is. A larger tank holds more gas (double duh) and thus gives you a longer runtime. This is especially helpful if you need to clean huge driveways and/or brick walls in one cleaning session. A pressure washer is one of the best investments any homeowner could make. It reduces the amount of water used while significantly increasing the amount of cleaning power of each droplet of water. A pressure washer is the only tool that’ll clean cars, patios, and/or concrete surfaces in hardly any time at the cost of a few pennies per hour of usage. There are two types of pressure washers to choose from based on their fuel source. The first is electric which is safer for the environment while still offering more than enough power to spray-clean cars, patios, and even stone surfaces. However, if you’re looking for a tank of a pressure washer, then gas-style pressure washers are for you. They’re the only type of cleaning system that’ll eliminate ugly graffiti from bricks and concrete surfaces. Gas-powered pressure washers can be dangerous though, so exercise extreme caution when operating one of these bad boys. 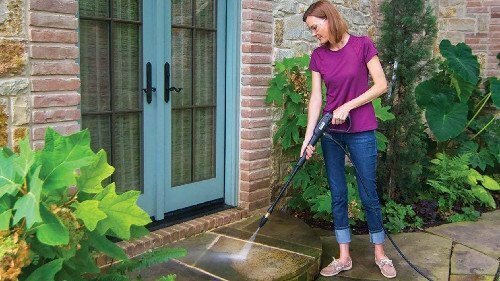 This article was split into three different buying guides: how to get the right pressure washer to clean cars, patios, and concrete. When cleaning your car, you’ll want an electric pressure washer which eliminates the risk of shattering windows and stripping paint. A maximum of 2,000 PSI will be safe for pre-rinsing your car. For patios, you may need at least 2,000 PSI for maximum cleaning. You may want to go higher to strip it of peeling or cracked paint. Cleaning patios can be done with either an electric or a gas pressure washer so feel free to go big. But if you’re spraying concrete and brick surfaces, then you absolutely have to go big. Only the beefiest gas-powered pressure washers will provide you with enough cleaning power to erase paint completely. 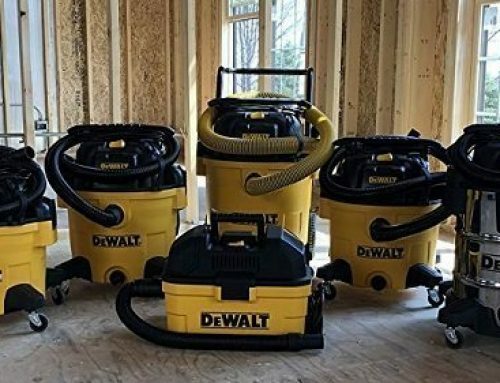 4,000-plus-PSI models are definitely something you should consider for concrete cleaning.